1Department of Pharmaceutical Sciences, Faculty of Pharmacy, Mulawarman University, Samarinda, East Kalimantan, 75119, INDONESIA. 2Faculty of Engineering, Universitas Negeri Jakarta, East Jakarta, 13220 INDONESIA. 3Pharmaceutical Research and Development Laboratory of FARMAKA TROPIS, Faculty of Pharmacy, Mulawarman University, Samarinda, East Kalimantan, 75119, INDONESIA. 4Department of Pharmaceutical Sciences, Faculty of Pharmacy, Universitas Indonesia, Depok, West Java, 16424, INDONESIA. Background: Bulbs of Bawang Dayak (Eleutherine palmifolia L. Merr; Synonym: Eleutherine americana L. Merr) from family Iridaceae is widely found and grown in Kalimantan island. The local tribe “Dayak” commonly consume this plant and become a traded commodity in traditional markets. This plant is trusted to treat various diseases. Objective: The present study aims to determine the effect of blood glucose reduction from bulbs of Bawang Dayak based on the use of different extraction methods using oral glucose tolerance test. Method: Dried sample was extracted with methanol using maceration, reflux, and Soxhlet method, respectively. The measurement of blood glucose reduction was performed using oral glucose tolerance test in vivo method and was analyzed using statistical comparison (Two-Way-ANOVA). Results: Based on the each extraction results was obtained yields of as 8.636% (reflux method), 11.87% (maceration method), and 14.023% (soxhlet method). While the results of blood glucose lowering effect on each extract were used, there were significant differences in statistical tests and organ index. Conclusion: This result is a preliminary stage and the information is invaluable for further research. ‹ The Effect of Coconut Water and Boiling on Antioxidant Activity and Total Phenolic Contents in Schizophyllum commune Fr. Ahmad I, Ambarwati NS, Indriyanti N, Sastyarina Y, Rijai L, Mun’im A. Oral Glucose Tolerance Activity of Bawang Dayak (Eleutherine palmifolia L. Merr.) 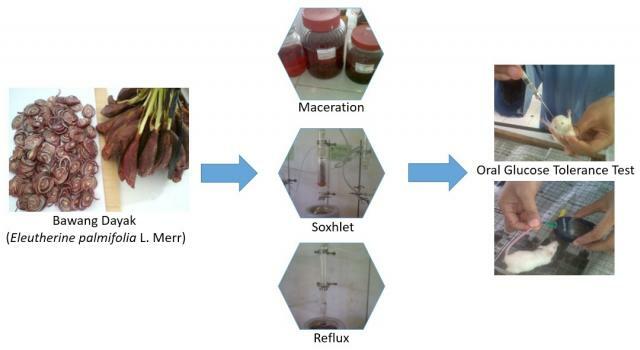 Bulbs Extract Based on the Use of different Extraction Method. Pharmacognosy Journal. 2018;10(1):49-54.